I've not always been Leviathan's biggest cheerleader in the past, describing it as 'grim, unyielding, reprehensible stuff' and finding the whole situation around True Traitor, True Whore too disturbing for comfort. Of course, this doesn't mean that it's actually bad black metal, on the contrary, the nihilism and self-hatred found at the core of the genre is written into the very DNA of Leviathan, and Scar Sighted is no exception. Now that Wrest is (apparently) a happy family man, appearing on the cover of Decibel magazine holding his infant daughter and getting friendly write-ups from the likes of Pitchfork and Vice, you would be forgiven for thinking that Leviathan's base sound must have changed. Well, Jef Whitehead may have salvaged his life, but there's still clearly much darkness within Wrest, and Scar Sighted proves it. Sure, it may have a much cleaner (and better) production than the likes of The Tenth Sub Level of Suicide, provided by Billy Anderson who is better known for his work with the likes of Neurosis and Brutal Truth than black metal. And the music itself is experimental enough to be very different from earlier Leviathan works. But above all else, the darkness inherent in the soul of this band and its creator simply writhes, making it a gripping listen. Equal parts black metal and ambience, with riffs that aren't recognisably made by any guitar from this plane of existence, yet far more interesting than your average minimalist depressive black metal record, Scar Sighted is a thoroughly modern look at misery. Opening with an untitled ambient intro, first track proper The Smoke of Their Torment is a blasting fury, initially almost like bleak death metal with Wrest's choked growls and slow, throbbing guitar. 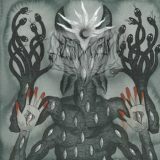 The shifting waves of riffs are closer to Deathspell Omega in style than other USBM stalwarts, although nowhere near as dissonant and still very clearly the work of Leviathan, particularly once the sampled voiceover and jazzy drumbeats begin. The following Dawn Vibration is closer to what I and probably you think of as Leviathan, black metal choking on filth and rottenness, breaking only for a despairing wail of misery, as though from a drowning man, before the dark waters close back over him. Even on their own, these tracks would be enough to make Scar Sighted a terrific album, but that they're not even the best on the album speaks volumes as to the quality on show here. The initial percussion-driven weirdness of Gardens of Coprolite is unsettlingly different, for example, and the throaty wordless yowling later in the track go stunningly well with the technically proficient drumming behind, all atop an ambient swamp. Wrest's vocals throughout the album are disturbingly heartfelt, the shrieks of Wicked Fields of Calm especially effective atop a demented mixture of post-rock melody and black metal buzz, but even the clean singing that opens Within Thrall would be shudderingly creepy alone if the track didn't explode into blackened aggression after. Wherever you look, quality lies. The ten-minute title track towards the end of the tracklisting is especially gripping, a slow, almost grandiose descent into doomy bleakness topped by echoing piano, but the reflective All Tongues Toward and closing Aphonos are equally impressive, the latter the most demented and heart-rendingly miserable vocal performance I've heard in a while. Comparing and contrasting Scar Sighted with True Traitor, it's easy to hear the improvement. This is bursting with ideas, the switching between growls and shrieks in A Veil is Lifted atop a near-industrial racket just one example. And it's surprisingly listenable, despite being so dark and wretched, and interesting – probably the most interesting that depressive black metal can be with its murky set of tools. Yes, this is still depressive black metal, that genre tag at the top of the page was chosen carefully. And yes, the real-life situation of Jef Whitehead came too close to drowning out the impact of his music. Scars are reminders of old wounds, after all, and a man as troubled as Whitehead will never be able to escape their gaze. But in the here and now, Scar Sighted suggests a fresh start for both man and band without a reduction in the quality of the music produced, as well as a damn good album that's among the best I've heard this year.